A great way to work on letter and word recognition; a child simply picks a board--the first letter of his or her name is always a good place to start--then fills in the uppercase and lowercase letters and identifies the picture. He or she can turn it over or take another board and do it all again. 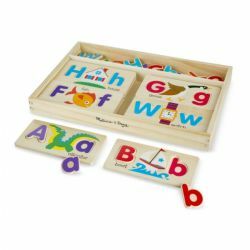 Contains each letter in the alphabet in both uppercase and lowercase. Ages 4–6.